Peter Travers is best known for his film reviews and interviews with movie stars. So why is he making predictions about the winners of television's biggest prize, the Emmy Awards? "I talk about movies all the time and we're excited about the fall and what happens with them," he explained on a special edition of his ABC show "Popcorn." "But what are we all now? We're slaves to TV." He continued, "And so, suddenly, the Emmys are crucial to our lifetime." The 70th annual Emmy Awards will be hosted this year by Colin Jost and Michael Che and broadcast Monday night at 8 p.m. ET on NBC. For Travers' predictions on who will win in the major categories, keep reading. 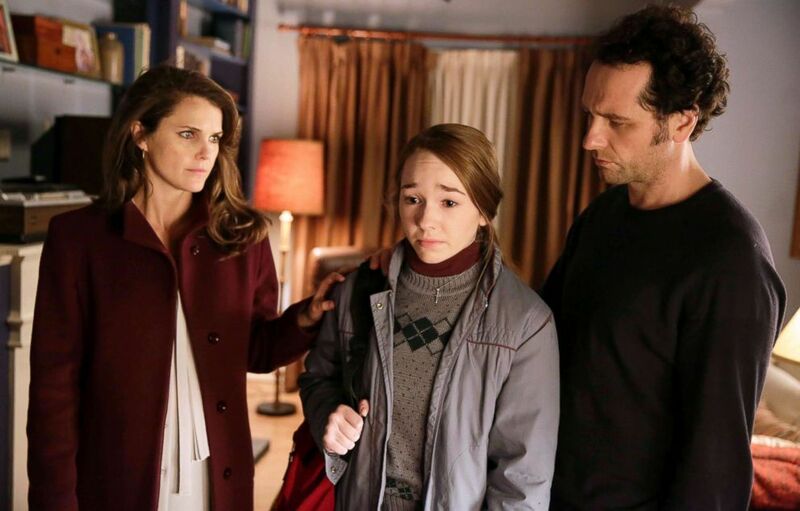 Keri Russell, as Elizabeth Jennings, Holly Taylor, as Paige Jennings, and Matthew Rhys as Philip Jennings, in a scene from "The Americans." The nominees are "The Americans," "Game of Thrones," "The Crown," "The Handmaid's Tale," "Stranger Things," "This Is Us" and "Westworld." Last year's winner, "The Handmaid's Tale," is up again this year, but Travers said the second season "isn't quite on par with the first one, but it's still amazing." The show he's wants to win is "The Americans." "It did its last season," he said. "It's been nominated to death and it's never won. C'mon, people, did you watch the last season? So, I'm rooting for that one." 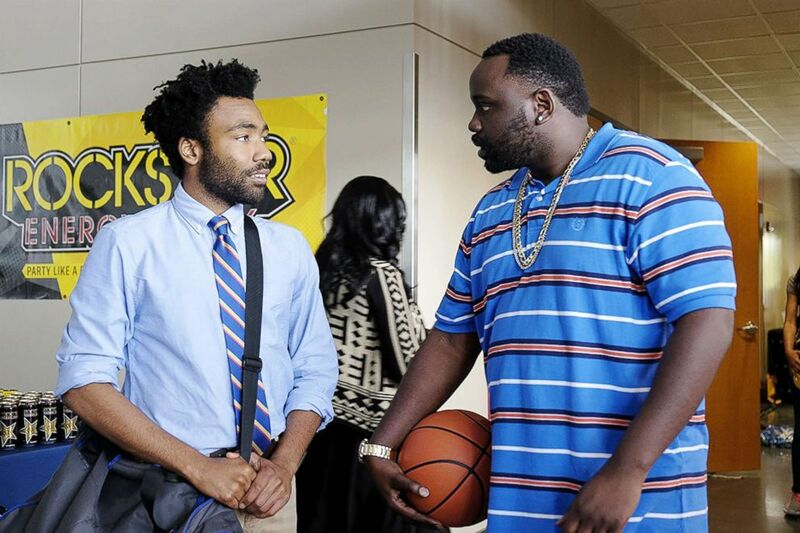 Donald Glover and Brian Tyree Henry appear in a scene from "Atlanta." The nominees are "Black-ish," "Atlanta," "Barry," "Curb Your Enthusiasm," "GLOW," "The Marvelous Mrs. Maisel," "Silicon Valley" and "Unbreakable Kimmy Schmidt." Once again, last year's winner, "Atlanta," is in the running. "I have nothing bad to say about this," Travers said. "This is for Donald Glover as the star, as a writer and director. Everything is triumphant. The second season was at least as good as the first one that he won for." But Travers also believes in spreading the love around and "The Marvelous Mrs. Maisel" has stolen his heart. "Something about this, set in 1958 in New York with a woman finding her voice through comedy, just hit me in the right kind of way," he said. "So all due respect to Donald Glover in 'Atlanta,' I'm out there rooting for 'The Marvelous Mrs. Maisel.'" Darren Criss stars in FX's series Versace. The nominees are "Godless," "The Assassination of Gianni Versace: American Crime Story," "Genius: Picasso," "The Alienist" and "Patrick Melrose." Jeff Daniels is "at his very best" and Michelle Dockery and Merritt Wever more than hold their own in the Netflix series "Godless." But Travers gives his vote to "The Assassination of Gianni Versace: American Crime Story." "Because this story of the murder of Versace is done so powerfully as a miniseries, we begin to understand [murderer] Andrew Cunanan," Travers said. "The way that Darren Criss plays him, we don't sympathize with this killer but we see how society helped create him. I'm all about that one." Sandra Oh, as Eve Polastri, in a scene from "Killing Eve." The nominees are Claire Foy, "The Crown," Elisabeth Moss, "The Handmaid's Tale," Keri Russell, "The Americans," Evan Rachel Wood, "Westworld," Sandra Oh, "Killing Eve," and Tatiana Maslany, "Orphan Black." Last year's winner, Elisabeth Moss, could easily win again. "I wouldn't object to that at all," he said. But at the risk of "sounding like a broken record," Travers is hoping Keri Russell will be in the mix for her final season of "The Americans." 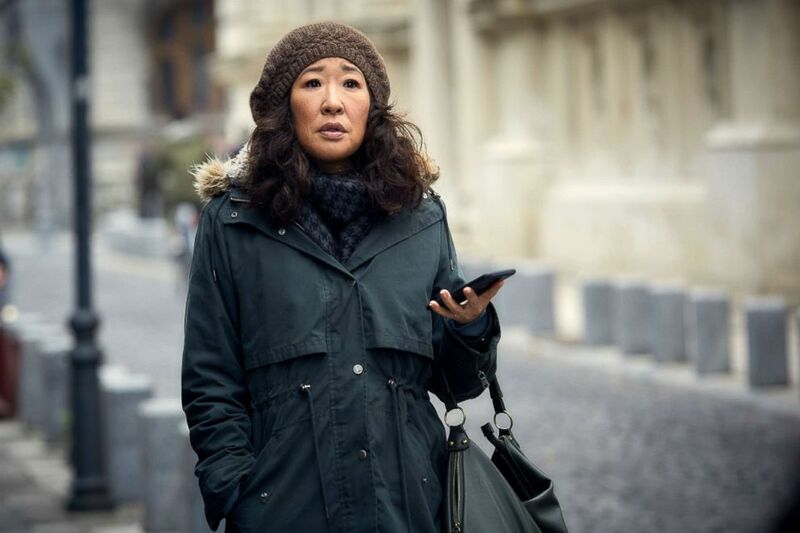 His top pick, though, is Sandra Oh for BBC America's "Killing Eve." "It doesn't have that wide audience, and she's basically a desk-bound spy who sort of rubbed shoulders with this assassin she's trying to catch, and it becomes between these two women something that I have never seen in TV before," he said. "So, you people have your work cut out for you." 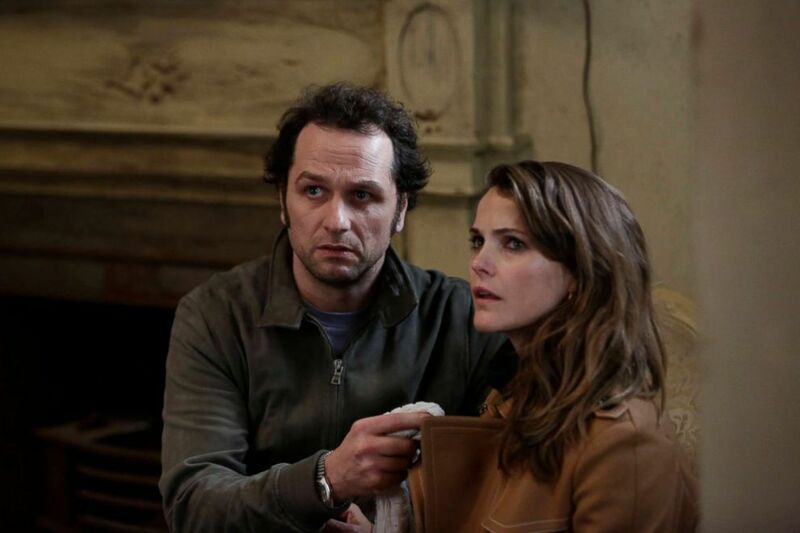 Matthew Rhys as Philip Jennings and Keri Russell as Elizabeth Jennings in the episode, "The Magic of David Copperfield V. The Statue of Liberty Disappears" of "The Americans" TV series. The nominees are Sterling K. Brown, "This Is Us," Jason Bateman, "Ozark," Jeffrey Wright, "Westworld," Ed Harris, "Westworld," Matthew Rhys, "The Americans" and Milo Ventimiglia, "This Is Us." Last year, Sterling K. Brown made history when he became the first black actor to snag an Emmy in this category. Travers said it's likely he will win again, but he's rooting for Matthew Rhys in "The Americans." "Did you see his scene in the garage where he's basically being faced by his friend Noah Emmerich, who he's betrayed?" he said. "Amazing!" The nominees are Tracee Ellis Ross, "Black-ish," Allison Janney, "Mom," Issa Rae, "Insecure," Lily Tomlin, "Grace and Frankie" and Rachel Brosnahan, "The Marvelous Mrs. Maisel." Without Julia Louis-Dreyfus, who has won this category more than a half dozen times, in the running, the race is wide open. "But, for me, this award needs to go to Rachel Brosnahan for 'The Marvelous Mrs. Maisel,'" Travers said. "This is a comedy that is an hour long, which kind of breaks that half-hour rule. 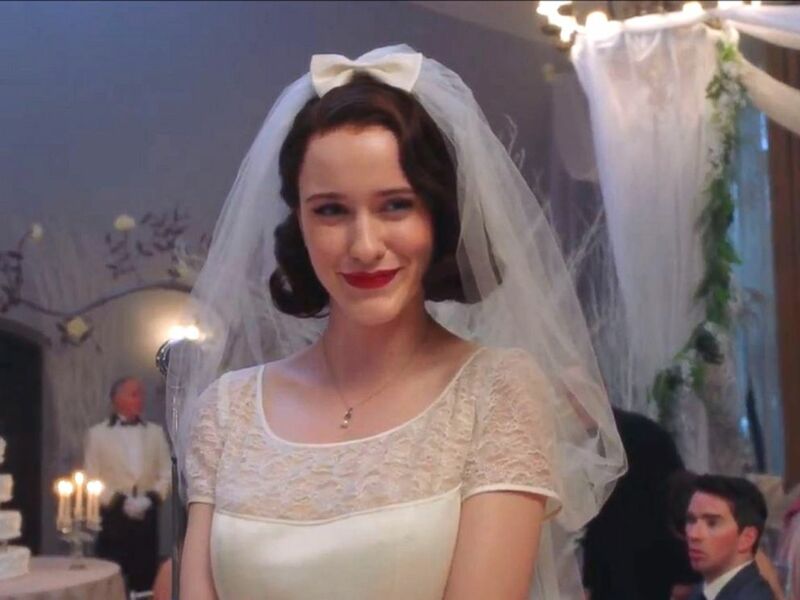 And Rachel Brosnahan sustains this show. She makes everything about this character nuanced and fascinating." 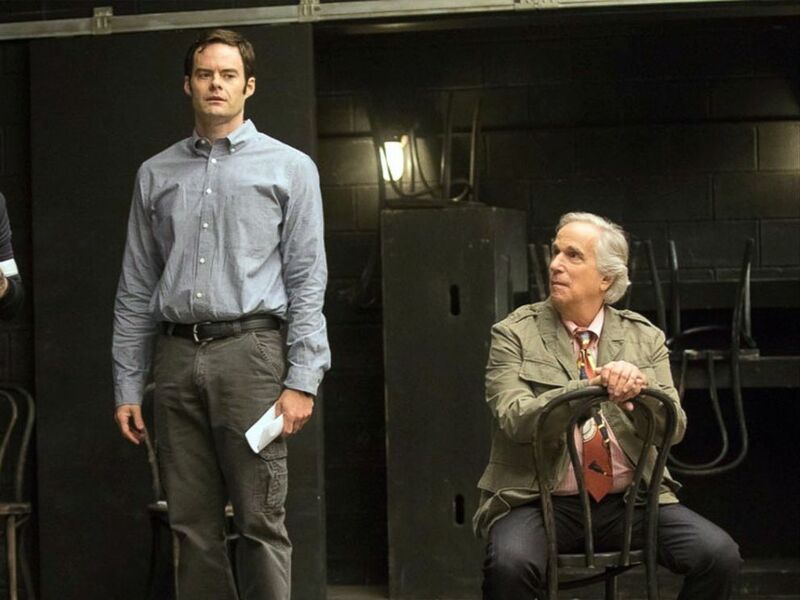 Rightor Doyle, Bill Hader and Henry Winkler in a scene from HBO's "Barry." The nominees are Anthony Anderson, "Black-ish," Ted Danson, "The Good Place," Larry David, "Curb Your Enthusiasm," Donald Glover, "Atlanta," Bill Hader, "Barry" and William H. Macy, "Shameless." Travers said the award will most likely go to Glover for "Atlanta," but he has to put in a word for Bill Hader. "Hader is a comedian who is really expert, but, here, playing a hitman who's going to acting class, he's doing something I've never seen him do before," Travers said. "He's found depths in this character that are terrific, and I think he should give Donald Glover a real run for his Emmy money." The nominees are Jessica Biel, "The Sinner," Laura Dern, "The Tale," Michelle Dockery, "Godless," Edie Falco, "Law & Order True Crime: The Menendez Murders," Regina King, "Seven Seconds" and Sarah Paulson, "American Horror Story: Cult." Travers calls Jessica Biel "terrific" in "The Sinner." "She's up for every scene," he said. But her competition is Laura Dern in HBO's "The Tale," about a woman having a conversation with her 13-year-old self over sexual abuse. "It's perfect acting," Travers said. "Laura Dern won last year for supporting in 'Big Little Lies' and is just getting better with each thing she does. So I'm going with Laura Dern for that one." The nominees are Antonio Banderas, "Genius: Picasso," Darren Criss, "The Assassination of Gianni Versace: American Crime Story," Benedict Cumberbatch, "Patrick Melrose," Jeff Daniels, "The Looming Tower," John Legend, "Jesus Christ Superstar Live In Concert" and Jesse Plemons, "Black Mirror: USS Callister." In another tough category, Benedict Cumberbatch gives a "bravura kind of tour de force" performance as a heroin addict in "Patrick Melrose." 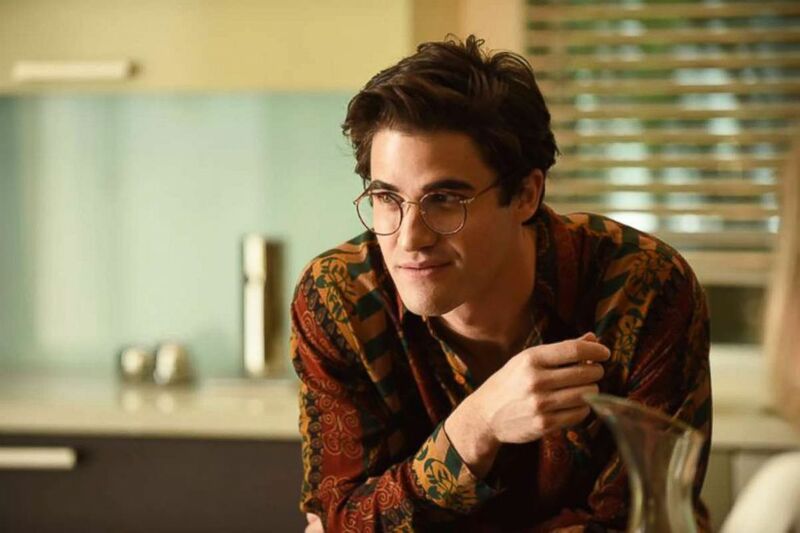 But Travers picks Darren Criss for his performance as Andrew Cunanan in "The Assassination of Gianni Versace: American Crime Story." "This is the guy from 'Glee' who we see basically playing characters who are lighter," he said, "and he gives substance to this and humanity to someone who's lost his own humanity. A really great performance." 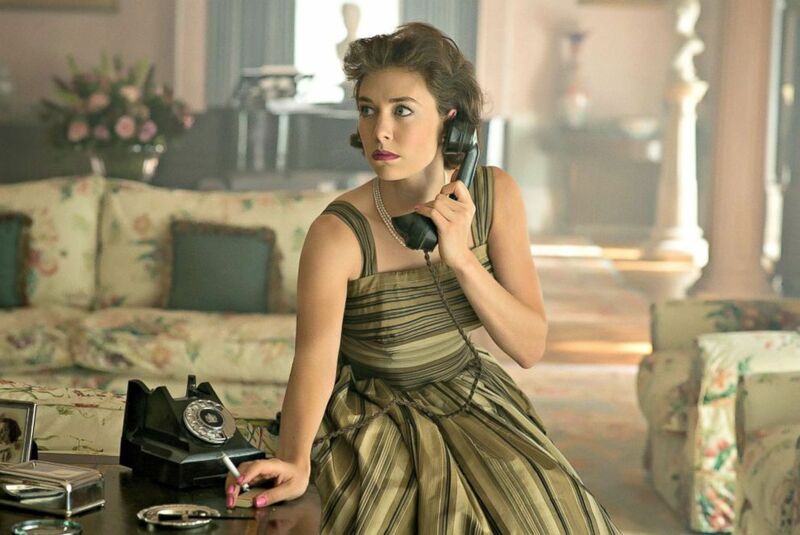 Vanessa Kirby stars as Margaret Windsor in Netflix original series, "The Crown". The nominees are Alexis Bledel, "The Handmaid's Tale," Yvonne Strahovski, "The Handmaid's Tale," Ann Dowd, "The Handmaid's Tale," Millie Bobby Brown, "Stranger Things," Lena Headey, "Game of Thrones," Thandie Newton, "Westworld" and Vanessa Kirby, "The Crown." Travers would have no objection to last year's winner, Ann Dowd, taking home the trophy, again, for "The Handmaid's Tale." But he's rooting for Vanessa Kirby for her role as Princess Margaret, sister to the Queen, in "The Crown." "What she does with this is so surprising, making somebody who lived in her sister's shadow come to the fore," he said about Kirby. "I'd like to see somebody new like this who is really so talented." The nominees are Nikolaj Coster-Waldau, "Game of Thrones," Peter Dinklage, "Game of Thrones," Joseph Fiennes, "The Handmaid's Tale," David Harbour, "Stranger Things," Matt Smith, "The Crown" and Mandy Patinkin, "Homeland." David Harbour was never better than this past season of "Stranger Things," Travers said. If he had to lose to somebody, he said, it should be Matt Smith for his role as Prince Phillip in "The Crown." Phillip is "not a likable character in any way," but Smith "gives him so many colors," Travers added. 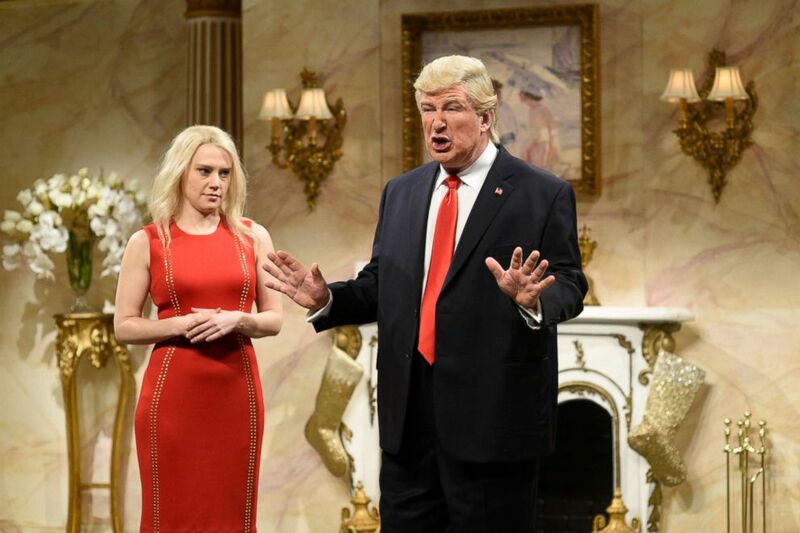 Kate McKinnon as Kellyanne Conway and Alec Baldwin as Donald Trump during the "Donald Trump Christmas Cold Open" sketch on Dec.17, 2016. The nominees are Alex Borstein, "The Marvelous Mrs. Maisel," Aidy Bryant, "Saturday Night Live," Leslie Jones, "Saturday Night Live," Kate McKinnon, "Saturday Night Live," Zazie Beetz, "Atlanta," Betty Gilpin, "GLOW," Laurie Metcalf, "Roseanne" and Megan Mullally, "Will & Grace." The women of "Saturday Night Live" make up nearly half of the category, and Travers thinks Kate McKinnon is likely to win again. "She's so great playing whatever celebrity, whether it's Hillary Clinton, whether it's Jeff Sessions, she plays them all brilliantly," he said. "But I want to say a word about Alex Boorstein in 'The Marvelous Mrs. Maisel,'" he said. "She's the woman who is managing Mrs. Maisel's career. She speaks the blunt truth about everything. She's hilarious doing it and she's also incredibly touching." The nominees are Louie Anderson, "Baskets," Henry Winkler, "Barry," Alec Baldwin, "Saturday Night Live," Kenan Thompson, "Saturday Night Live," Tituss Burgess, "Unbreakable Kimmy Schmidt," Brian Tyree Henry, "Atlanta," Tony Shalhoub, "The Marvelous Mrs. Maisel" and Matt Walsh, "Veep." Travers is not sure Alec Baldwin needs another trophy for playing Trump, having already won last year. But he does like Henry Winkler as assassin Barry's drama teacher. Winkler gives the money-grubbing character "heart" and "humor" and "some bitterness as well." The edge, however, goes to Tony Shalhoub as Mrs. Maisel's father, a role he "does miracles with."